Treluswell is a well-positioned bungalow just a stone's throw from the heart of the Lizard village centre. 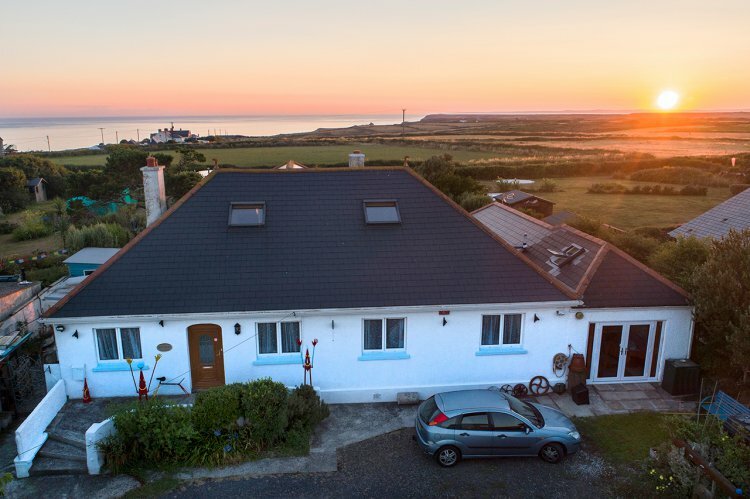 There's wonderful sea views from a spacious first floor living area and with a sun room and enclosed garden, this makes a perfect spot for family holidays. Beaches, shops, pubs and restaurants are all within easy reach as well as miles of coastal walking. Situated just 50 metres from the shops, pubs/restaurants, cafes and popular chip shop. A half mile walk takes you to the coastal footpath and Lizard Point. Beautiful Kynance Cove is just a mile away by foot or just a couple of minutes by car. Once on the South West Coastal Path there’s access to miles of stunning coastal walking in either direction, northwards to Kynance Cove and, for the more energetic, beyond to Mullion Cove. Or southwards to Lizard Point, continuing to Cadgwith Cove for lunch at the Cadgwith Inn before the return walk. The property has most of its rooms on the ground floor but with a large first floor lounge with lovely sea views. The ground floor lounge is a cosy room with a TV, ornamental fireplace and views of the garden. The kitchen diner is well equipped featuring a range cooker with gas hob, fridge, separate fridge/freezer, washing machine, dishwasher, microwave, kettle and toaster as well as the dining table. Off the kitchen there’s a sun room which looks out across the garden with further seating and coffee tables. Bedroom one has a 5' king-size bed with bedside tables and lamps, wardrobe and dresser unit. Bedroom two is also a king-size bedroom with bedside tables and lamps, wardrobe and drawers. The third bedroom is a 4'6" double with a bedside table and lamp, single wardrobe, drawers and a washbasin. The family bathroom has a bath with shower over, WC, handbasin and a heated towel rail. There’s also a separate ground floor WC. Also, on the first floor there is a shower room with WC and handbasin. There is a stairway to the upper floor which is the spacious lounge with lots of seating, TV and lovely sea view which also catches the sunset. Outside is a lawned garden area and parking for two cars. The fencing in the back garden encloses a private space for guests to enjoy as a dog free zone, as the owners live in their own self-contained annexe next door and have a friendly dog who is good with children. They will also be happy to help should you need any assistance. Rental includes WiFi, bedlinen, heating, electricity and gas. Regret no pets and no smoking.